Subject: Save the Date April 28, 2007 for "65 Does 60"
We’re Back, but we never went away, (sounds like the start of a country and western song). It is hard to believe that one year ago this coming weekend we celebrated the best 40th Class Reunion ever. If you were here you know how much fun, fellowship and renewal we enjoyed. If not, by now all of you should have received the Memories Package of the Monticello 40/65, the DVD and the dual CD’s of music (courtesy of our wonderful Benefactors). In pictures, video and song, it reminds us of our past as we enjoy our lives & friends today. We are still working through the lists of you that did not receive the Memories and we promise to get them to you before the end of the year. Thanks in advance for your continued patience. 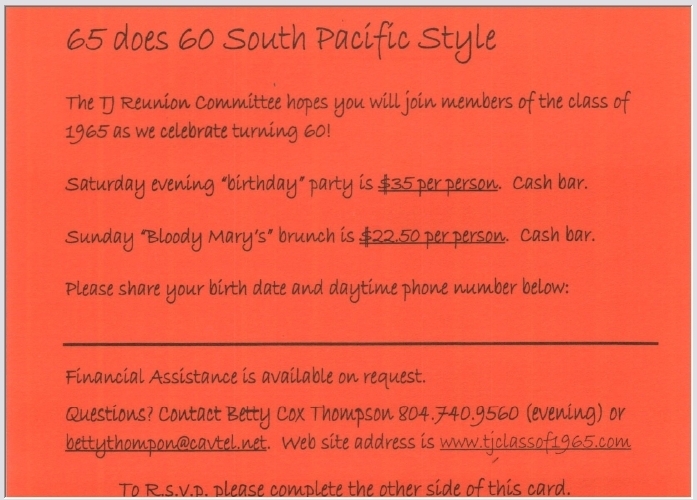 Remember to check all the class news through the web site often www.tjclassof1965.com. Charles Douglass continues to amaze all of us with his dedication and creativity in making the web site a must see and BOOKMARK for us all. Thanks Charles. With a heavy heart and in sympathy, since the reunion we have lost 3 classmates, 2 teachers and 3 classmate parents. The web site has all the details and obituaries where possible. Many classmates have appeared in various articles and stories about their careers and lives. Please note the Benefactors and thank them when you see them for all their continued support as well as the committee members for their dedication. Continue to send news, pictures and notes so we can put them on the web site. 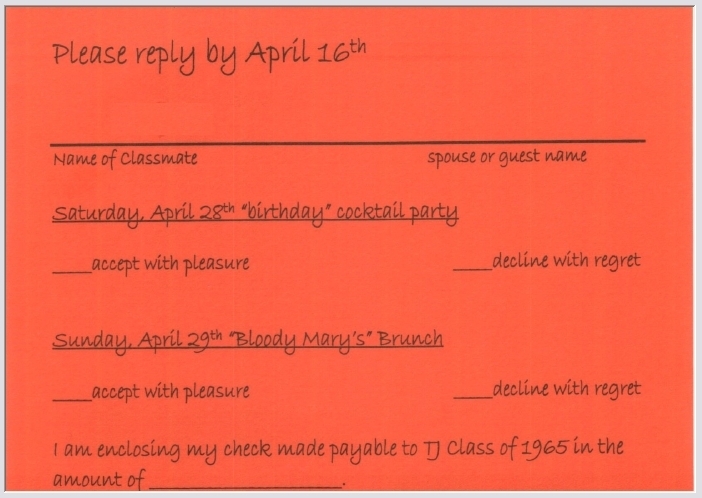 Remember if you send something, you are granting us permission to place it on the web site. We also reserve the right to decide what does and does not appear on the website. The web site is where you can find all this and more, so check it out often and be sure to Bookmark it. NOW WHAT NEXT!!! April 28, 2007-save the date!! Your reunion committee recently had a “vision” meeting facilitated by our own Wayne Nystrom; to discuss what our mission is going forward and what are we hearing from you as to a 45th or 50th reunion or something else all together. The answer and feedback was why wait. So your planning committee, (Janie Huske Satterfield, Betty Thompson Cox & Marilyn Lipsitz Flax) met and realized most of us are going to celebrate a big birthday within the next year (or already have) so why not have a big Birthday Bash together. Janie called it “65 does 60”. Plus if you remember our senior musical was “South Pacific” so the birthday theme will be very Tropical, & casual, details to come. 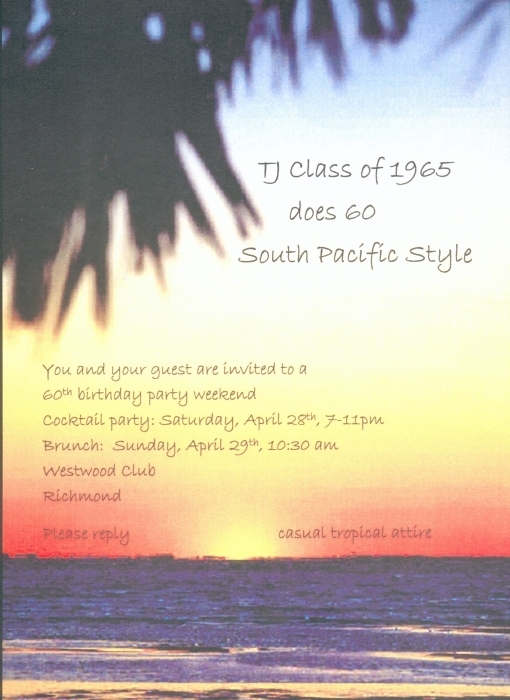 MARK YOUR CALENDAR FOR APRIL 28, 2007 AT THE WESTWOOD CLUB IN RICHMOND FOR AN EVENING OF FUN, MUSIC, FOOD AND CELEBRATION! WHO WILL JUMP OUT OF THE CAKE IS JUST ONE OF THE BIG SURPRISES. BE SURE TO SEND US YOUR BIRTH DATE. With your continued support and encouragement your reunion committee stays dedicated to keeping the spirit of the Class of 1965 alive. Stay in touch and Stay Tuned! !